Lactobacillus casei are Gram-positive, facultatively anaerobic, non-motile and non-spore-forming, rod-shaped (cell size range = 0.7-1.1 x 2.0-4.0 micrometer) members of the industrially important lactic acid bacteria. Like other lactic acid bacteria, L. casei are acid tolerant, cannot synthesize porphyrins, and possess a strictly fermentative metabolism with lactic acid as the major metabolic end product (Axelsson, 1998; Kandler and Weiss, 1986). Within the genus Lactobacillus, L. casei form part of the facultatively heterofermentative (Group II) species cluster, which produce lactic acid from hexose sugars via the Embden-Meyerhof pathway and from pentoses by the 6-phosphogluconate/phosphoketolase pathway (Axelsson, 1998). Growth of L. casei occurs at 15 but not 45oC, and requires riboflavin, folic acid, calcium pantothenate, and niacin growth factors (Kandler and Weiss, 1986). L. casei are a remarkably adaptive species, and may be isolated from raw and fermented dairy products, fresh and fermented plant products, and the reproductive and intestinal tracts of humans and other animals (Kandler and Weiss, 1986). Industrially, L. casei have application as human probiotics (health-promoting live culture), as acid-producing starter cultures for milk fermentation, and as specialty cultures for the intensification and acceleration of flavor development in certain bacterial-ripened cheese varieties (Fonden et al., 2000; Fox et al., 1998; Kosikowski, 1982). The 9th edition of Bergeys Manual of Systematic Microbiology recognized four subspecies of L. casei: L. casei subsp. casei, L. casei subsp. pseudoplantarum, L. casei subsp. rhamnosus, and L. casei subsp. tolerans (Kandler and Weiss, 1986). However, more detailed phylogenetic studies have led to proposals that members of the L. casei group be divided into three species: L. rhamnosus, L. zeae and L. casei, with L. casei ATCC 334 as the neotype strain for the latter species (Chen et al., 2000; Collins et al., 1989; Dellaglio et al., 1991; Dicks et al., 1996; Mori et al., 1997). L. casei have a G + C content of 45-47%, and the proposed neotype strain, ATCC 334, has a genome size previously estimated at 2.2 Mbp (Ferrero et al., 1996; Kandler and Weiss, 1986; Tynkkynen et al., 1999). Axelsson, L. 1998. Lactic acid bacteria: classification and physiology, pp. 1-72. In, S. Salminen and A. Von Wright (eds). Lactic Acid Bacteria: Microbiology and Functional Aspects, 2nd ed. Marcel Dekker, Inc, New York. Chen, H., C. K. lim, Y. K. Lee, and Y. N. Chan. 2000. Comparative analysis of the genes encoding 23S-5S rRNA intergenic spacer regions of Lactobacillus casei-related strains. Int. J. Syst. Evol. Microbiol. 50:471-478. Collins, M. D., B. A. Phyllips, and P. Zanoni. 1989. Deoxyribonucleic acid homology studies of Lactobacillus casei, Lactobacillus paracasei sp. nov., subsp. paracasei and subsp. 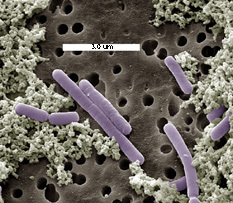 tolerans, and Lactobacillus rhamnosus sp. nov., comb. nov. Int. J. Syst. Bacteriol. 39:105-108. Dellaglio, F., L. M. T. Dicks, M. du Toit, and S. Torriani. 1991. Designation of ATCC334 in place of ATCC393 (NCDO 161) as the noetype straion of Lactobacillus casei subsp. casei and rejection of the name Lactobacillus paracasei (Collins et al., 1989). Int J. Syst. Bacteriol. 41:340-342. Dicks, L. M. T., E. M. du Plessis, F. Dellaglio, and E. Lauer. 1996. Reclassification of Lactobacillus casei subsp. casei ATCC 393 and Lactobacillus rhamnosus ATCC15820 as Lactobacillus zeae nom. rev., designation of ATCC 334 as the neotype of L. casei subsp. casei, and rejection of the name Lactobacillus paracasei. Int. J. Syst. Bacteriol. 46:337-340. Ferrero, M., C. Cesena, L. Morelli, G. Scolari, and M. Vescovo. 1996. Molecular characterization of Lactobacillus casei strains. FEMS Microbiol. Lett. 140:215-219. Fonden, R., G. Mogensen, R. Tanaka, and S. Salminen. 2000. Effect of culture-containing diary products on intestinal microflora, human nutrition and health  current knowledge and future perspectives. International Dairy Federation Bulletin number 352, IDF, Brussels. Fox, P.F., P.L.H. McSweeney, and C.M. Lynch. 1998. Significance of non-starter lactic acid bacteria in cheddar cheese. Aust. J. Dairy Technol. 53:83-89. Kandler, O., and N. Weiss. 1986. Genus Lactobacillus, pp. 1063-1065. In, P. H. A. Sneath, N. S. Mair, M. E. Sharpe, and J. G. Holt (eds. ), Bergey's Manual of Systematic Bacteriology, vol 2, 9th ed. Williams and Wilkins, Baltimore. Kosikowski, F.V. 1982. Cheese and fermented milk foods, 2nd ed. Kosikowski and Assoc., Brooktondale, N.Y.
Mori, K., K. Yamazaki, T. Ishiyama, M. Katsumata, K. Kobayashi, Y. Kawai, N. Inoue, and H. Shinano. 1997. Comparative sequence analyses of the genes coding for 16S rRNA of Lactobacillus casei-related taxa. Int. J. Syst. Bacteriol. 47:54-57. Tynkkynen, S., R. Satokari, M. Saarela, T. Mattila-Sandholm, and M. Saxelin. 1999. Comparison of ribotyping, randomly amplified polymorphic DNA analysis, and pulsed-field gel electrophoresis in typing of Lactobacillus rhamnosus and L. casei strains. Appl. Environ. Microbiol. 65:3908-3914.